In almost all cases, cataract surgery is performed as an outpatient. Your outpatient cataract surgery is likely to be performed at either of our two surgical centers; Surgical Center of Burlington County (Willingboro) or The Eye Surgicenter of NJ (Millville). 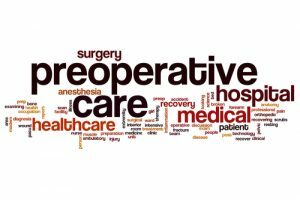 Here is a complete list of PRE-OPERATIVE instructions to help you best prepare for your upcoming surgery and is the same list of instructions you likely received from our office. Below are some remarks which emphasize and better explain some of the instructions. If you have question, please call us. Your family doctor or PCP (primary care provider) must medically clear you for surgery. You will need a history and physical completed within 3o days of your surgery. We will provide a history and physical form at the time of scheduling. Please return this form to our office 1 week prior to your surgery. Medical clearance, by law, is required for all surgery. We want to make sure you are healthy enough for surgery. Your safety and health is important to us. “NPO after midnight” means nothing to eat or drink after midnight in preparation for your cataract surgery. Make sure not to eat anything after midnight on the night before your surgery or in the morning of your cataract surgery. Food in your stomach takes hours to digest and eating after midnight could cancel your surgery. This can include coffee, tea and water. When having anesthesia, it is safest to have a completely empty stomach. Even cream mixed with coffee or tea can be dangerous. Only medications for heart, blood pressure or seizures can be taken the morning of surgery with a sip of water. Please bring any other medications with you to the surgical center. If you take insulin, please bring your insulin and syringes with you. If you are not sure about which medications to take on the day of surgery, please give us a call or consult your family doctor. Outpatient surgical centers allow you to go home after cataract surgery and do not require an overnight stay in the hospital. On rare occasion, certain health issues may not allow your surgery to be performed in an outpatient surgical center. Both of our surgical centers are very experienced with eye surgery. I have performed tens of thousands of cataract surgeries between these two surgical centers and my teams are exceptionally experienced. You will be impressed with their talents and expertise. Anesthesia will be provided by our board-certified anesthesiologist. Outpatient surgical centers are great for everyone, allowing efficient service while providing an exceptional level of care. After your surgery, you may have a light snack. Please bring a lunch or snack after the surgery, especially if you are a patient with diabetes. Expect to be at our surgical center for 3 hours on the day of your cataract surgery. Three prescription eye drops were sent to your pharmacy. Remember to start the drops 3 days BEFORE your surgery and to bring the drops with you on the day of surgery. Starting the drops before surgery gives your eye a better chance to heal from the inflammation caused by surgery and to fight infection. It is our hope that this series of articles answers all of your questions about your upcoming surgery. If you still have questions, please give us a call (609.877.2800). When is a Cataract Ready?